This entry was posted on Saturday, August 29th, 2015 at 6:24 pm and is filed under Disasters, Mississippi. You can follow any responses to this entry through the RSS 2.0 feed. You can leave a response, or trackback from your own site. On this weekend in 2005, I had just met my husband. I had just started back up with a beloved client again to finish more of what we started. I also had just finished designing my mother’s new Gulf Coast house and was there in Gulfport, enjoying the sultry breezes, a few cocktails and amazing gulf seafood, catching up with family and friends. We knew a hurricane was out in there, but we consulted with all the neighbors who were, along with us, veterans of Hurricane Camille. We even knew where the water went up to in our neighbor’s house, and the storm surge wasn’t going to be that high. 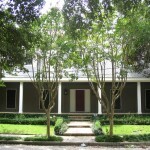 We would probably hang out upstairs with the shutters closed and the worst that could happen would be six inches of water on the newly refinished pecan wood floors. We scoffed at the idea that we would need to evacuate – there had been so many false alarms in the past, here and when I lived in New Orleans. In a flash flood one day in the early 90s I was stuck on the interstate for nine hours within spitting distance of my Garden District exit, so there was no way we were joining an exodus of people onto Highway 49 to get out, only to be turned away. And then it got serious. My new almost boyfriend (now husband, who had been in the U. S. Navy) called and asked the address of mom’s house, and when he found the place on the map, he started getting emphatic. “Do you realize how serious this is? You have got to get out of there!”. So the denial slipped away, and we called Robby’s mom who still lives in the old nighborhood that was well out of the storm to see if we could stay the night, then packed up the supplies we were going to use for the storm and headed over. The last thing my mom said about the house was “do you think we should get sandbags for the windows? If there are only a few inches of water reaching the house, they may stop it – I am so worried about ruining the floors…” I think I rolled my eyes or something and told her that it’s time to go. I had become sufficiently convinced that the storm was going to be bigger than we thought. Robby’s family was fantastic – they had all sorts of systems for survival in place for once the water and power inevitably went dead, and in between watching the wind in the trees predict how close Katrina was coming we ate a lot and watched the news on the solar powered tv, took naps then awakened to ride the storm out in the wee hours of the morning. The storm proceeded to pummel the Coast for an entire night and day, many hours longer than Camille did. We all sort of went into a type of shock, because we didn’t need to see the news to know that there would be nothing left. It took a while for us to get back to the beach, because the destruction from the storm had blocked streets and intersections. We did arrive at what was left of our house just before the National Guard, the press and the looters got in, the latter two before the former. 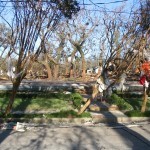 All of a sudden, there we are, talking to Harry Smith standing on the pecan floor, and noticing women rifling through the massive debris that was now our neighborhood. The reality then became that we needed to get the hell out of there, because it was crushingly obvious that there was nothing to be done or saved. We managed to get up Highway 49 over countless downed trees and power lines, shocked by how far inland the destruction was all the way back to Jackson, where my mom’s primary residence is. We noted what a luxury it was that her building had a generator so we were able to be cool and get clean, after almost three days of hurricane experience. We were very fortunate to have that luxury, as it was not so for so most. 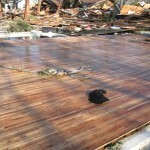 Our friends and family suffered extreme hardships and many lost everything. People died during and in the aftermath from the stress and fear and seeing the world look like the apocalypse had happened. None of these are happy memories. I am very grateful for the few days before Katrina ruined everything, because my childhood hometown looked more beautiful and lush and graceful than ever before, and I got to relive the best parts of my memories by driving down Highway 90 with my mom, commenting on every house that we loved to talk about since I was old enough to say veranda. They lined the beach drive like beautiful ladies in a row, having an afternoon cocktail and watching the water. It hurts to know that they are not there anymore – gone along with the surge of the tide of a natural disaster. I only wish I’d taken a “before” video. Great essay. Those of us who were in MIssissippi at the time will never forget Katrina. The national media ignored us then and now have once again 10 years later. Thank you, Adair. I agree. But we know.